Chicago Mayor race Update….Preckwinkle in trouble? 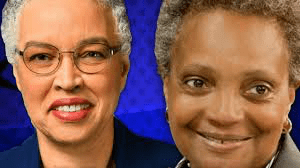 There is a runoff vote between Toni Preckwinkle and Lori Lightfoot…..
Preckwinkle has pulled her ads….. The coverage of this race hardly mentions Lightfoot, who is almost 20% ahead in the polling…. Chicago mayoral candidate Toni Preckwinkle has halted all television ads, a stunning development just two weeks before the election. Could this be a sign of trouble in the campaign? Political strategists say that in a race like this, once you go up on TV, you don’t go dark. One political observer suggested Preckwinkle may concerned about what her polling is showing. When asked if the commercials were halted because money was running out, Preckwinkle responded: “We’re making strategic decisions to put us in the best place to win this campaign. Her campaign did say that they “should be back up soon.”…..
*A WGN poll shows Lightfoot with 58 percent of the vote, compared to Preckwinkle’s 30 percent….